Joe’s always amazed by people that work for the same company for a majority of their lives. Joe just can’t imagine. 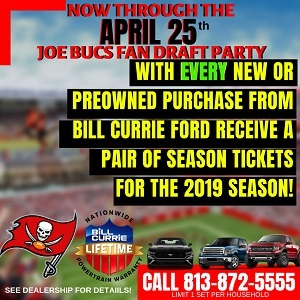 The Bucs have one such employee, Jill Hobbs, who took a temporary gig with the Bucs processing season ticket orders on a manual cash register in 1976, per a story honoring her on Buccaneers.com. The following spring, on April 15, 1977, Hobbs accepted a full-time position on the Buccaneers’ staff…and that means that, remarkably, this Sunday marks her 35th year with the team. In a surprise company ceremony this week, Team Glazer dropped a $35,000 check on Hobbs to commemorate her service. Click on through the story above. Joe thinks it’s pretty cool. Hobbs was the right hand for Rich McKay at one point in her career. The woman is a walking Bucs historian. I saw this yesterday. What a great story! That is class. 100% class. I really do not understand the hate for these owners by some. Sure…there are times they are cheap. But the Bucs are not the Redskins or the Eagles, who spend through the nose and have nothing to show for it. I love our owners and this is the sort of reason why. Good move. A loyal employee is just about priceless.